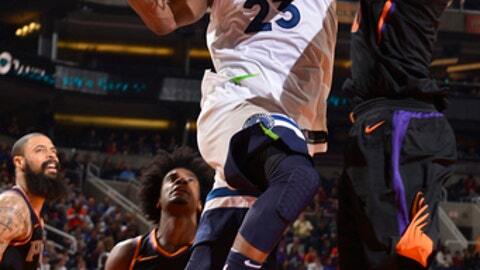 PHOENIX (AP) The scoring was balanced but there was no doubt who led the Minnesota Timberwolves over the Phoenix Suns. The Suns, who had won three of four, opened the third quarter with a 22-6 outburst to cut the Minnesota lead to 70-65 on Warren’s driving layup with 5:25 to play. The Timberwolves responded with a 9-2 run, Butler starting it with a three-point play and ending it with a dunk that had the Minnesota up 79-67 with 3:34 left. Then came a flurry of 3s – two by Daniels, one by Canaan – and Dragan Bender’s two free throws with 1:30 left sliced the Timberwolves’ lead to 80-78. The teams traded baskets before Minnesota scored the final four of the quarter, Crawford’s driving layup sending the Timberwolves into the final quarter leading 86-80. Barring any setbacks, Phoenix scoring leader Booker is expected to return when the Suns are home against Memphis on Tuesday night. Booker has missed nine games with a left adductor sprain. He’s averaging 24. 3 points per game and scored at least 30 in 10 of his last 20 games before he was hurt. Phoenix has gone 3-6 in his absence. Timberwolves: Minnesota’s 20-13 start is tied for third-best after 33 games in franchise history. Only 24-9 in 2001-02 and 22-11 in ’03-04 were better. … Butler’s season high is 38 against Philadelphia on Dec. 12. Suns: With Canaan taking his playing time, point guard Mike Smith was waived by Phoenix. … Triano needs one more victory to reach 100 as an NBA head coach. … Suns erased double-digit deficits to win three of their previous four games. … Phoenix didn’t make a field goal until game was 5:10 old. …. Suns had their highest-scoring third quarter of the season (37) after scoring 43 in the first half.